What is Breath Refresher Chews for Dogs? Given on a daily basis, Breath Refresher Chews for Dogs help break down plaque and debris to help improve your dog's breath. The mint and peppermint help fight odor, while parsley oil may also help with digestive issues. For dogs only. Store in a cool, dry place. Oat flour, rye flour, brewers dried yeast, glycerin, parsley powder, algae whole meal, arabic gum, soy lecithin, water, maltodextrin, sodium alginate, calcium sulfate, citrus pectin, sorbic acid (a preservative), parsley seed oil, propionic acid (a preservative), mixed tocopherols (a preservative), peppermint oil, mint flavor, papain. Breath Refresher Chews for Dogs are mint- flavored chews specially formulated to attack the most common causes of bad breath caused by digestive problems, poor oral health, and diet. Breath Refresher Chews help break down plaque and debris to help freshen breath. Breath Refresher Chews are a non-prescription (over-the-counter) product. 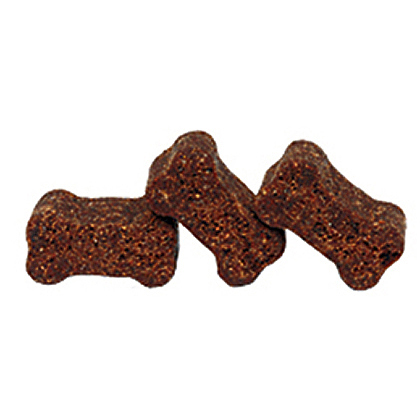 For dogs less than 20 lbs give 1 chew daily as needed, and for dogs over 20 lbs give 2 chews daily, as needed. For veterinary use in dogs only. Do not give to cats. Store this product tightly closed, in a cool, dry place. Keep out of the reach of children. 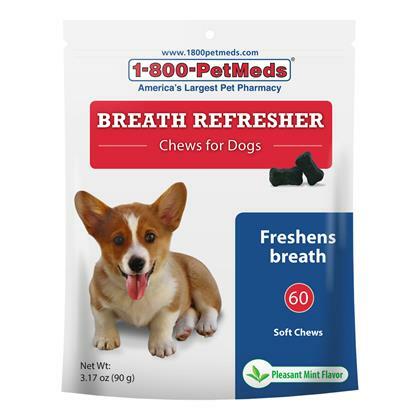 Breath Refresher Chews for Dogs are mint flavored. For dogs only, do not give to cats. The most common causes of bad breath are digestive problems, poor oral health, and diet. Give 1 chew daily, as needed. Give 2 chews daily, as needed. Should be stored in a cool, dry place. Keep container tightly closed. Other Ingredients: Oat flour, rye flour, brewers dried yeast, glycerin, parsley powder, algae whole meal, arabic gum, soy lecithin, water, maltodextrin, sodium alginate, calcium sulfate, citrus pectin, sorbic acid (a preservative), parsley seed oil, propionic acid (a preservative), mixed tocopherols (a preservative), peppermint oil, mint flavor, papain. *Not recognized as an essential nutrient by the AAFCO Dog Nutrient Profiles. ¹ One USP Unit of Papain activity is the activity that releases the equivalent of 1 ug of tyrosine from a specified casein substrate under the condition of the assay. This product contains sources of Papain (hydrolyzes protein).